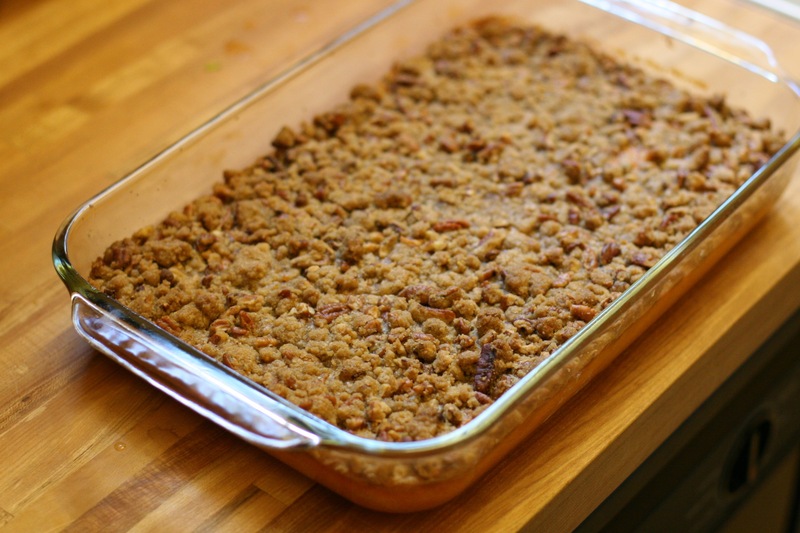 In the spirit of Thanksgiving, I thought I would share a special recipe with you: Mrs. Hughes Sweet Potato Casserole. My Mom’s colleague, Ken, brought his mother’s Sweet Potato Casserole to some work gathering long ago and I’m here to tell you that our Thanksgivings have been transformed because you are sure to find Mrs. Hughes’ Sweet Potato Casserole at our table. To celebrate and keep with tradition, I’m making it again this year. Thank you Hughes’ family for passing along your delicious recipe as it has made our holidays so very special each and every year. Bake the sweet potatoes (4-5 medium-sized) in a 400 degree oven for 45 minutes or until tender. Let cool. Peel the sweet potatoes and beat until all lumps are gone. Add sugar, melted butter, eggs, vanilla, and milk. Beat well until blended. Set aside and prepare topping. Blend together brown sugar, flour, and melted butter and add chopped pecans. Butter a 2-3 qt baking dish. Spoon the potato mixture into the dish and top with brown sugar mixture. Bake at 350 degrees for 25 minutes. (Mrs. Hughes cooked it a little longer until the topping was crispy and brown). Someone else who shall remain nameless might have doubled the topping but I have no idea who that could have been. That so looks like a recipe that my great grandmother would have put together. And she would’ve put the marshmallows on top too. I’ve never had it with marshmallows on top but I know folks LOVE that. Thanks for your comment!